Free of the burden of battle, they quickly take stock. They have four good engines, their saving grace. But they have no flaps, no brakes, only a magnetic compass and airspeed indicator for instruments, a badly wounded navigator, and no idea what bearing to take home. All they know is west, over now about four hundred miles of ocean. They know they can’t make it back over the Owen-Stanley mountains to Seven-Mile Strip. They’ll have to land at Dobodura, just inland of the New Guinea east coast. But where is it? Are they north or south of it? Britton says south; they need to head right. Zeamer disagrees; they’re north of it. Though fading, he’s still pilot-in-command, so south they turn. Britton asks Able if he can take the controls while Britton tours the plane, assessing the casualties and situation. Even with shrapnel in his legs, Able says yes. Zeamer has had all of his crew take a turn at the controls as insurance against just such a situation. Able, with designs on being a pilot himself, is happy to put the training to use. Once again, preparation has paid off. Britton begins tending to the wounded. Zeamer waves off morphine initially, concerned it will dull his senses, but eventually takes some. Vaughan comes forward to check on things. He’s shocked at Zeamer's state and learns about Johnston. Jay asks him to radio Dobodura to tell them their situation and to prepare for them. 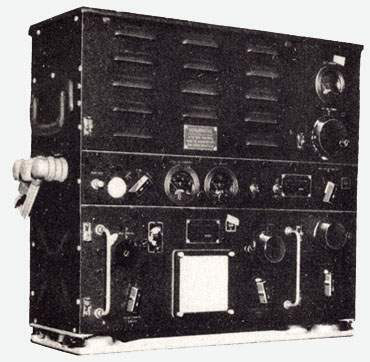 Vaughan tells Zeamer his radios are shot out, but he has the extra liaison transmitter he brought as a back-up. He’ll do what he can with it. Pudge Pugh comes forward from the tail gun to check on his good friend Joe, who, clutching his rosary, hasn’t moved. Pugh administers oxygen to Sarnoski while Britton works on Johnston, who is now prone in the cramped nose compartment next to Joe and asking about Joe’s condition. After Britton leaves, Pudge reassures Johnston that Sarnoski is fine. He isn’t. Pudge holds Joe in his lap in the loud, windy nose compartment amidst the scores of spent cartridges, debris, and blood. 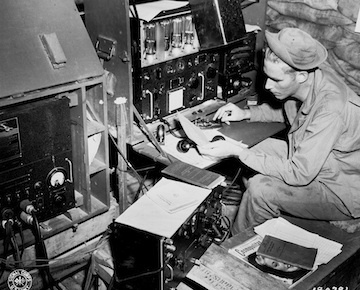 It is there, at age 28, that Joseph Raymond Sarnoski—one of the forty to volunteer, two years before, to form the new 13th Reconnaissance Squadron—spends his last ten minutes on Earth. In two days, he would have been on an airplane home. Vaughan, though weak from loss of blood from his neck wound, has had to work by Morse on the liaison unit, but it’s enough. Loading up the antenna for all it’s worth, he sends their position as best as he can figure it back to Seven-Mile Strip. It takes him a few tries, but finally he gets verification back from base. They can hear him. They send him a reciprocal and weather report. Using his facility chart, Vaughan works out an educated guess to Dobodura and hopes it’s right. He writes down a heading on a piece of paper: “247°M”—west southwest. Zeamer was right to have headed south. Vaughan takes it to the cockpit. Zeamer is conscious again and advises Able with turning to the new heading. By this time Britton has used up the morphine and attended to the wounded as much as he can. He finally returns to his seat. Able joins Vaughan, Kendrick, and Dillman in the back. Pugh remains in the nose compartment with Sarnoski and Johnston. Occasionally Johnston asks Pugh to describe landmarks to him, still doing his best to navigate himself though covered in blood and still in considerable pain. Now it’s a waiting game. It’s two hours to Dobodura. It’s an open question whether Zeamer can last that long. All their hopes are pinned on Vaughan’s heading. It’s almost dead-on. Dobodura is ready for them. The men in the back assume crash positions in the radio room. Pugh stabilizes Sarnoski and Johnston. Britton tells Able to stand behind and between the pilot and copilot seats to help secure Jay. With no brakes or flaps, Britton is landing hot. He cuts the engines just before the tires touch to help slow the plane. The landing is so smooth the crew can barely tell they’re on the ground. As the aircraft rolls, and rolls, to the end of the 6000-foot runway, Britton gently turns it off into the dirt in a smooth arc. 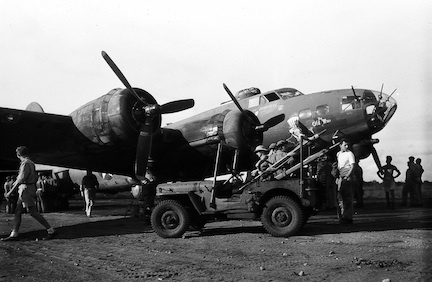 after 8 March 1943 mission. Jeeps and an ambulance roll up even as the Fortress settles to a stop. Men and medics jump out as crew members begin to deplane. One of the medics says, “Don’t bother with the pilot. He’s gone.” It’s just a misunderstanding from the Morse communications, but it gets a sharp rebuke from the crew anyway. Gently Jay, Joe, and Johnston are lifted from the plane. Kendrick, meanwhile, back in his job as photographer, carefully retrieves their other precious cargo, the sole reason for the trip. They spend the night at Dobodura. Jay has lost almost half his body’s blood supply. Amputation of the leg at the knee is assumed, but first they have to get blood into him. They don’t have blood at Dobodura, but they have plasma. The medics get enough plasma into him to keep him alive overnight, and while they do, the surgeon spends hours working on his mangled left leg. The next morning they are all flown back to Port Moresby. Dyminski, still hobbled by malaria, has forced himself from bed to copilot the flight. At the hospital, seeing Zeamer’s perilous condition, Jay’s close friend Milton “Doc” Gusack personally donates two units of much-needed blood immediately to Zeamer in a direct transfusion, resting in a cot over Zeamer’s. When it proves not enough, the word goes out and fellow squadron members line up outside the hospital to donate more blood to Jay. It’s enough, but barely. Zeamer lingers near death for two days before beginning his nine-month hospitalization. Scores of pieces of metal are removed from his body. In an astonishing feat of field surgery, his left leg is saved. Within a few years, though he’ll still have to skip down stairs due to the lack of mobility, he’ll be skiing and playing tennis—kind of. As long as he doesn’t have to chase the balls. Joe Sarnoski is buried a few days later. The crew members who can, wounded and otherwise, attend his funeral. It is two weeks before Jay learns the fate of his friend. He is heartbroken, and can’t help feeling guilty, despite being assured, and knowing himself, that Sarnoski would have had it no other way. You do what you have to do, and if necessary, do more. He leaned forward all the way. He died for the photos. Did we get the photos? Zeamer wants to know. Was the mapping successful? Yes. The mission itself was a complete success. So is the naval invasion of Bougainville Island, at Empress Augusta Bay, four and a half months later, using the maps made from their photos. It doesn’t take long for word to begin spreading about the mission. Within a month Fifth Air Force has recommended both Zeamer and Sarnoski for the Congressional Medal of Honor. “I have only twice before in my military career recommended anyone for the Medal of Honor,” writes Col. Merian Cooper, World War I veteran and famed film producer of King Kong. 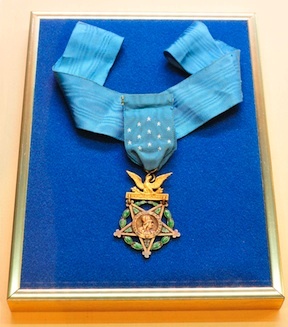 Ultimately Zeamer and Sarnoski do both receive the Medal of Honor, Joe posthumously in December by his widow Marie, Jay at Army Air Forces headquarters in Washington, D.C., in January 1944. It is only the third time two members of the same crew have received the Medal of Honor for the same mission. 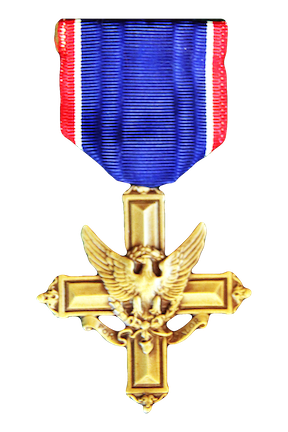 The rest of the crew on that mission receive the Distinguished Service Cross, only one step removed from the Medal of Honor. 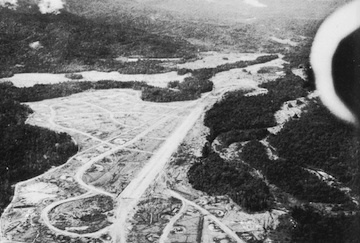 That has never happened before or since, and it makes the 16 June 1943 mission over Bougainville the most highly decorated mission not just of World War II, but of any American war. When added to the multiple decorations they’ve already earned individually, it also makes the Eager Beavers the most highly decorated air crew in American history. The mission is the end of Zeamer’s Eager Beavers, but it isn’t the end of the pursuit of excellence that made it possible for them to complete it. Thues and Vaughan go on to fly with Dyminsksi, now a pilot in his own right, while Able returns to the 8th Photo Recon Squadron, joined this time by Herb Pugh. In September, however, Vaughan, Pugh, and Able are all sent back to the States together, all assigned to the same unit. Able and Vaughan both return for second tours of duty. Wherever they go, though, the men don’t forget Jay’s and Joe’s philosophy: Forget fate, always be prepared, and always go above and beyond. As for Zeamer himself, he returns to the U.S. to begin his stateside recovery in August 1943. When he disembarks in San Francisco, he is met on the gangplank by Dalton McCullar—Ken McCullar’s father.